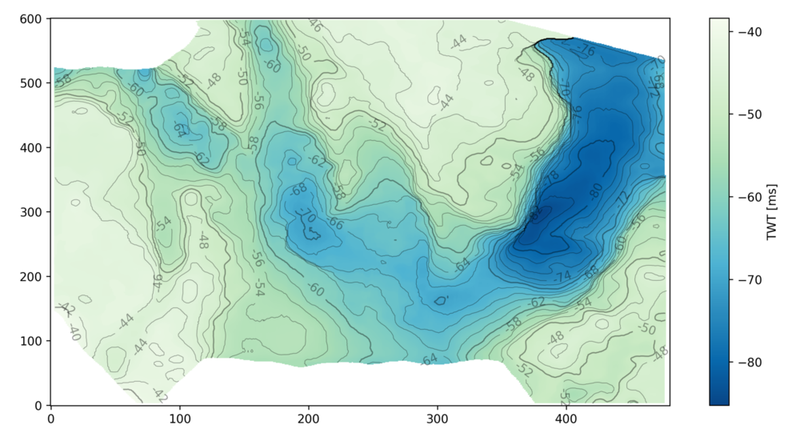 But making a contour plot look nice takes a little more work than most of matplotlib's other plotting functions. For example, to change the contour levels you need to make an array containing the levels you want... another line of code. Adding index contours needs another line. And then there's all the other plotty stuff. Load the data from a binary NumPy file. Check the data looks OK.
Get the min and max values from the map. Make a filled contour map and overlay contour lines. Make a map with index contours and contour labels. The accompanying notebook sets out all the code you will need. You can even run the code right in your browser, no installation required.